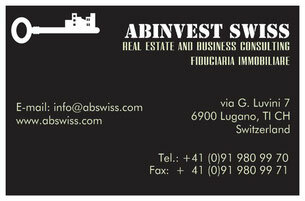 Abinvest Swiss offers you a wide selection of apartments, houses, villas, property for floors and grounds. Below you can see a selection of available items. We will be happy to provide you with more information and to show you more items in our office. To set up an appointment please contact us via e-mail or our telephone number that you can find on the contact page. VOLETE VENDERE o AFFITTARE LA VOSTRA PROPRIETÀ? CONTATTATECI SUBITO!